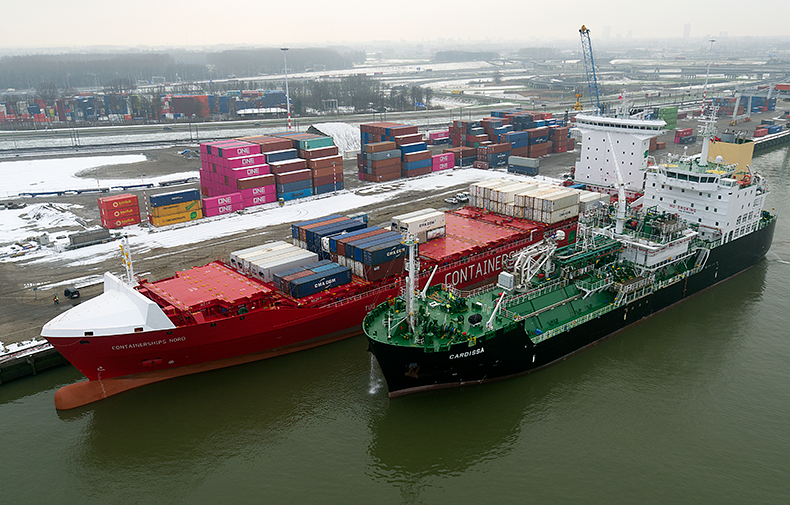 Containerships announced that their first LNG-powered container vessel, M/S Containerships Nord, successfully underwent her first marine LNG bunkering at the Port of Rotterdam. Around 240 metric tons of LNG was bunkered to the vessel – an amount that can take her on a roundtrip from Rotterdam to St. Petersburg and back sailing through the Kiel Canal twice. The ship started sailing from China towards Europe in December and reached the European waters after passing the Suez Canal after two and half weeks sailing. Three sister vessels will follow M/S Containerships Nord’s same route after their delivery later this year. After receiving the next two newbuilds, Containerships can start offering its customers a service based on LNG in large extend. These vessels have endurance of 14 days with LNG, and they will be bunkered once per roundtrip during their regular service loop between Containerships’ core ports in the North and Baltic Seas. As part of the agreement signed by Containerships and Shell, Shell will supply the LNG for Containerships’ vessels via ship-to-ship bunkering at the Port of Rotterdam. All the newbuilds will be bunkered by Shell bunker vessels, including the Cardissa.